at our salon. We welcome new clients from Placerville and outlying areas including Camino, Pollock Pines, Diamond Springs, Shingle Springs, Cameron Park, El Dorado Hills and the greater Sacramento area. 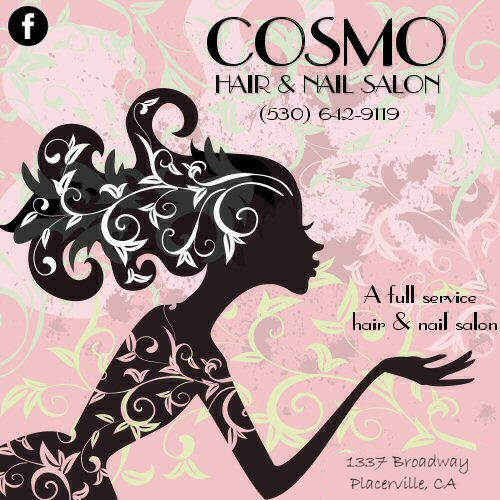 Refer your friend to any stylist at Cosmo Salon and they will receive 20% off services* on their very first visit to Cosmo Hair Salon. And to thank YOU for your confidence in us, we will give you 20% off services* on your next visit ! Phone us at (530) 642-9119 and mention this website for these discounts. Or drop in, we are located at 2944 Cold Springs Road around the corner from Home Depot in Placerville, California. *Discounts on services only please, product purchases are not included. This is a limited time offer and good only for future visits. To receive your discount, you must mention our website at the time of making your appointment. Please 'like us' on Facebook!